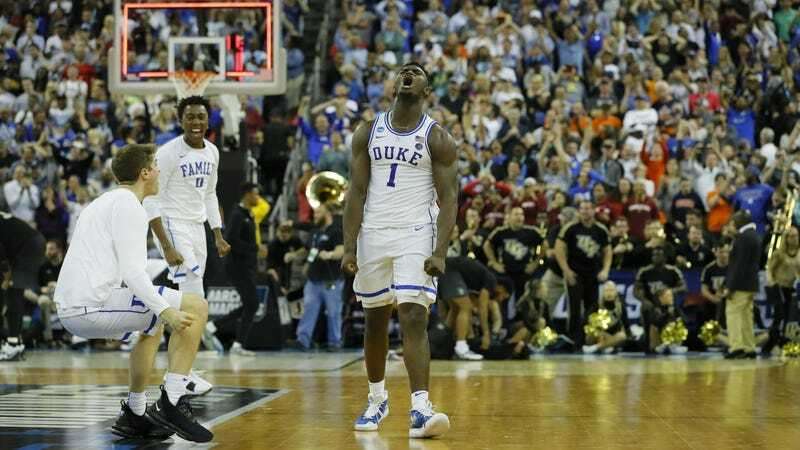 The UCF Knights gave the Duke Blue Devils way more of a fight than anyone dared hope they could, but ultimately they came just short of what would have been a bonkers second-round upset. Riding a 32-point performance from Zion Williamson, Duke escaped to the Sweet 16 with a 77-76 win. The game turned on a four-point possession for Duke with around 15 seconds to play. With the Blue Devils down 76-73, Zion Williamson drove the lane, and with all his power, challenged UCF giant Tacko Fall head-on at the basket. Williamson got the bucket and the foul, missed the free throw, and then fellow fab freshman R.J. Barrett got the rebound and the layup to give Duke the lead. UCF still had a chance to win, and they came agonizingly close to pulling it off. On the final play, B.J. Taylor’s first attempt failed, and when Aubrey Dawkins flew in for the put-back tip-in, the ball rolled around but did not go down. It was brutal. Duke can catch their breath for a few days, and then they’ll get either Liberty or Virginia Tech next.